My son had a few extra days off school this week, so on Friday we took a road trip down south a bit to attend the Circleville Pumpkin Show. 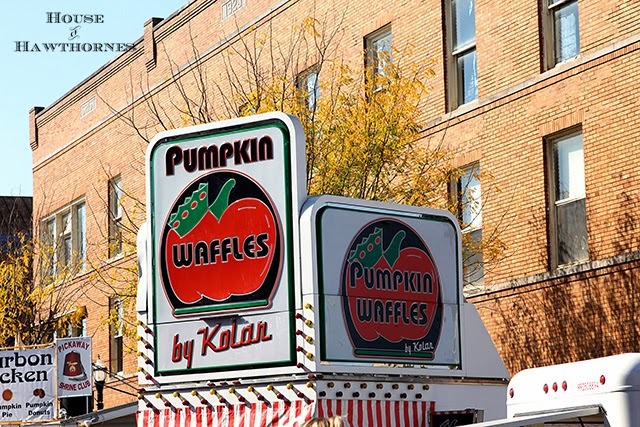 It’s a mid-sized Ohio town’s ode to everything pumpkin and is pretty much of a big deal around here. The city folk from up near Columbus get to travel down to immerse themselves in all things fall and farm. And get their fill of everything pumpkin. One of the fun things about the show is that they have all sorts of foods made with pumpkins. Pumpkin donuts, pumpkin chili, pumpkin burgers, pumpkin brownies, blah, blah, blah. I really don’t even like pumpkin, so I steered clear of the pumpkin based foods and had some fair fries instead. Yes, I had fair fries as my dinner. Don’t judge. In Circleville, and even up here in downtown Columbus, people will put out their lawn chairs along a parade route to mark their viewing spot. And other people just respect their chairs. You wouldn’t think about moving someone else’s chair or sitting in it. 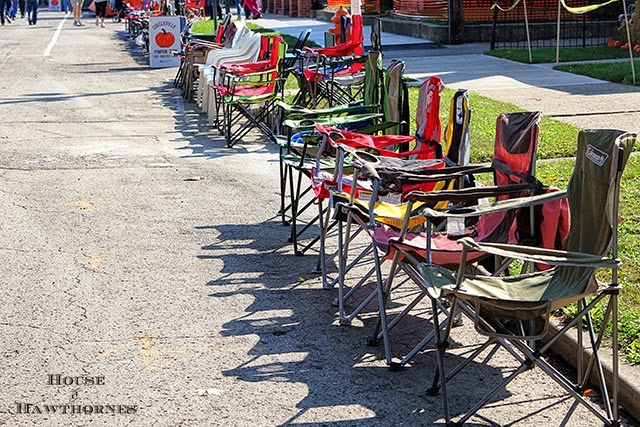 And some of these chairs sit there for hours and even days (they have a lot of parades for this particular festival). My New York born husband finds this a totally weird concept and doesn’t understand why their chairs aren’t stolen or vandalized or at the very least moved. I asked people on facebook if the chair thing happens in their towns and I was surprised that it doesn’t seem to be an Ohio thing or even a small town thing. I guess people all over the country are pretty respectful of other people’s parade stuff. And what a nice thought to end a fun weekend on. 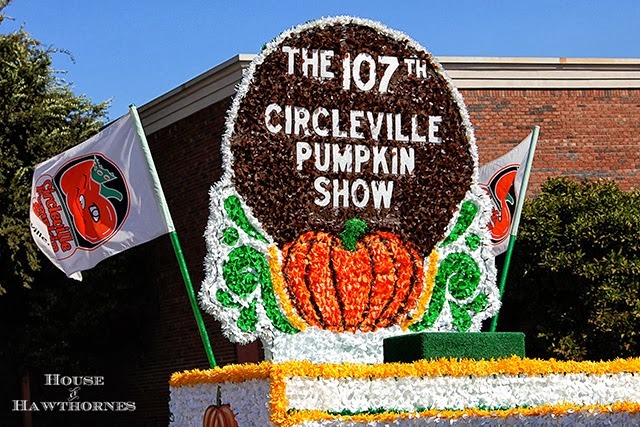 For 2017, the Cirleville Pumpkin Show will be held on Weds, October 18th through Saturday, October 21st. The 1st Pumpkin Show was held in 1903. Lindsey’s Bakery in downtown Circleville bakes a pumpkin pie 6 foot in diameter and weighing over 400 pounds. Oh, I love the taste of pumpkin so I would have been in culinary heaven. Fair fries are wicked awesome though, too, especially with malt vinegar. In Freeport, Maine, home base of L.L. Bean’s, the company has wonderful musical acts. People in town put their chairs up and their stakes are respected. However, if you are driving miles to participate, you arrive and have slim pickings. I appreciate staking your claim, but it is a bit frustrating to arrive from away and have no place to sit. No to complain, but it doesn’t seem fair. Was that a pun? That looks like my kind of festival! Love it! I like fair fries, too and when it comes to eating out at those things, anything goes in my book. You can be good any other day. So, you are in Columbus? I was born just an hour due north of that. Shelby. Our little town is like that. Well, unless you are one of those people who pull pranks on others, your chair could end up at the top of the flag pole or something like that. I love the float photo! That’s how we made them in Shelby! They make crap ones here, let me tell you. That might be an Ohio thing. Tons and tons of tissue paper. Oh, those were the pretty floats. We’ve punkined up, too. I guess it was pumpkin feast or famine for the local farmers, depending on how much rain stayed in their fields. We did have a lot of rain, and a lot of pumpkins rotted. I’ve gone early and placed my chair for more than a few parades. I can’t believe it doesn’t work that way all over New York. State, that is. Macy and I are totally envious of your pumpkin adventure day. The volume and variety is amazing and love the sunshine too. We however would be gobbling down every pumpkin dish offered — double on the doughnuts! Thanks for taking us along! There is an old game played outside called King of the Hill. The one to make it to the top before the others is the King! So the top pumpkin had a crown! He’s the King!!! When we go to powwow, you can set up your chairs days in advance and leave them there all weekend and no one will touch them. I really thought it was only a Native American thing, so it is great to know it happens everywhere! I love the pumpkin with the writing on it. We do that with our names on our pumpkins. That is very courteous of folks to not move or steal the chairs and is rare in this day and age. Yes, but don’t leave an Ipad on that chair! LOL! 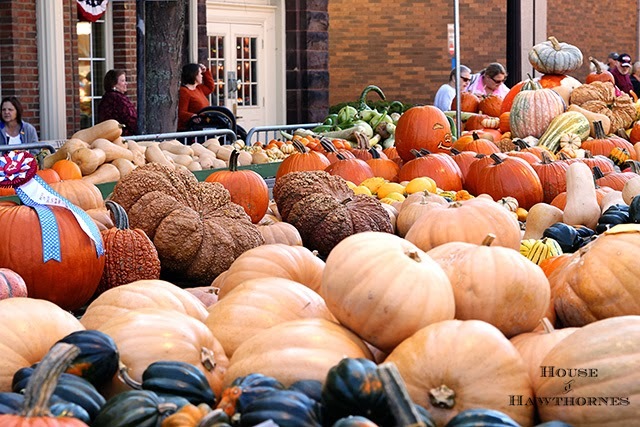 I love pumpkins, pumpkin food, pumpkin everything and Fall everything! Thanks for sharing as they evidently don’t care for them down here as there is very little of it and no one even decorates! But I do and the children here appreciate it. I have lights outside and a lighted pumpkin in the window and pumpkins on the steps and ghosts in the trees. I love all your decorations! Happy Fall! What a neat festival! My family eats everything pumpkin and we might never get out! Thanks for posting these pictures! Wowwie! That is one huge pumpkin tower! 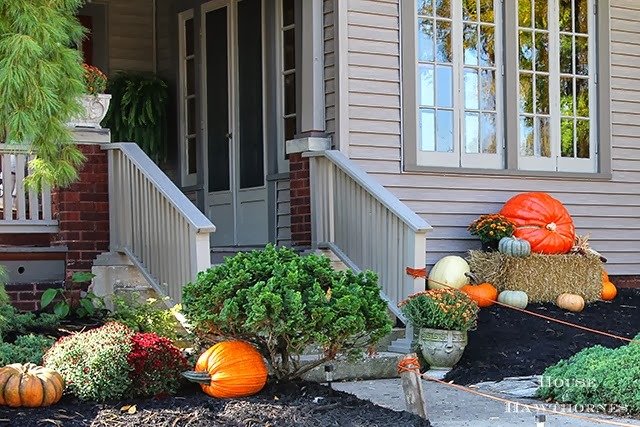 What a great way to celebrate and to get in the spirit of Fall. 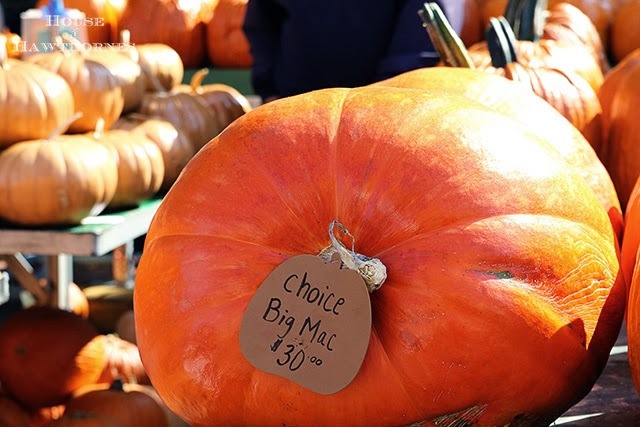 If giant orange pumpkin don’t put one in the Fall mood, nothing will. As for the parade route… folks here do the same thing. Set up chairs, and put out blankets to save their spots. Your pictures are amazing. That looks like a festival we need to visit. We bow to the Great Pumpkin!! 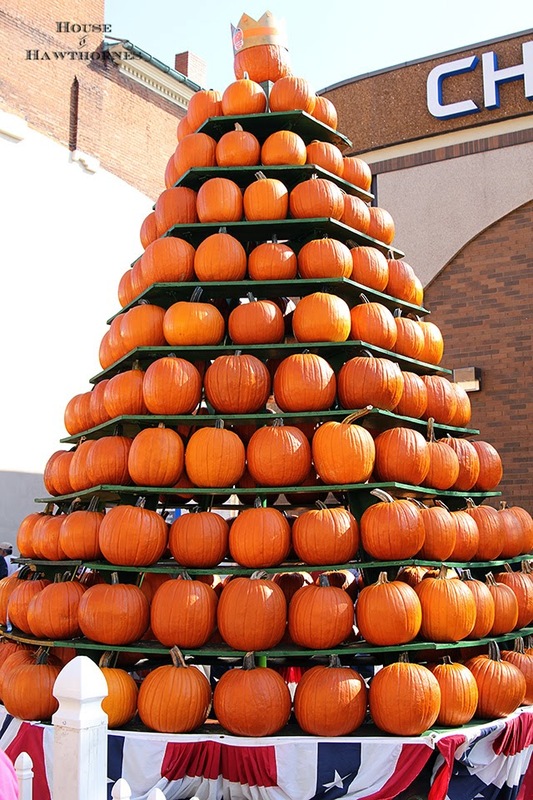 Love that tower of pumpkins!! 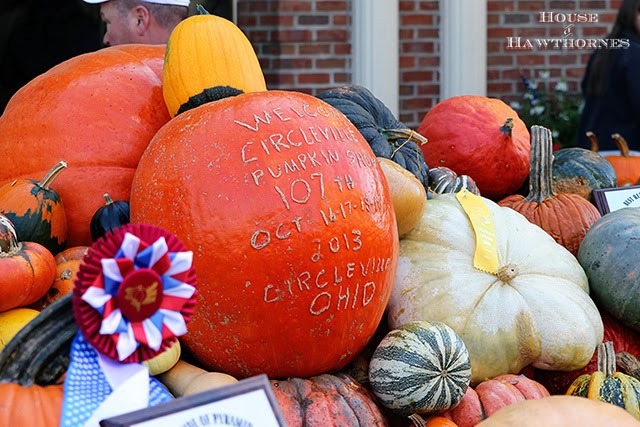 Did you know the Circleville Pumpkin Show is the oldest and largest festival in Ohio? It is also the 6th largest festival in the United States. Just a little Pumpkin Show trivia. Your photos make the festival look so lovely. My daughter and I went last Friday night and we’d never been before. I was so disappointed in it. It was so crowded you could hardly walk and we could barely find anything “pumpkin”. It just seemed like the state fair, but crammed into a small downtown. So glad you had a better experience that we did. OK, I would have been in heaven because I love anything pumpkin!!! sounds like so much fun! But, I’m like your hubs, I can’t imagine chairs staying put here for more than a few minutes…doesn’t say alot for our town I guess. It’ just a big college town so there’s lots of naughty college kids roaming the downtown streets. 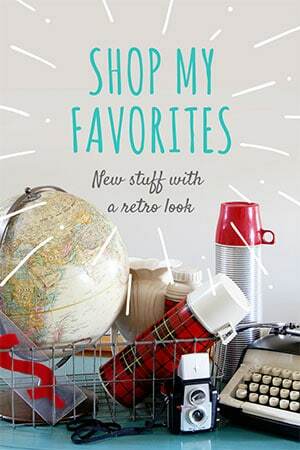 thanks for sharing all the fun pics! 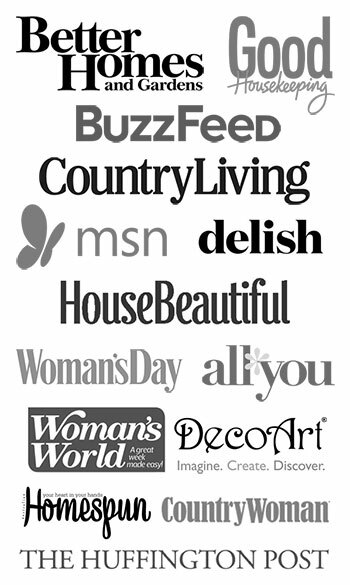 Really liked your post – making it my Pick of the Week for Common Ground’s Be Inspired link party. Reminds me of the Keene festival in NH. Lots of goof family fun. Have a great week!